I knew I wanted soup for dinner yesterday, but I was torn on what to make… So, I opened the floor for our fantastic Facebook followers to put in some requests, and vegetable barley won out. 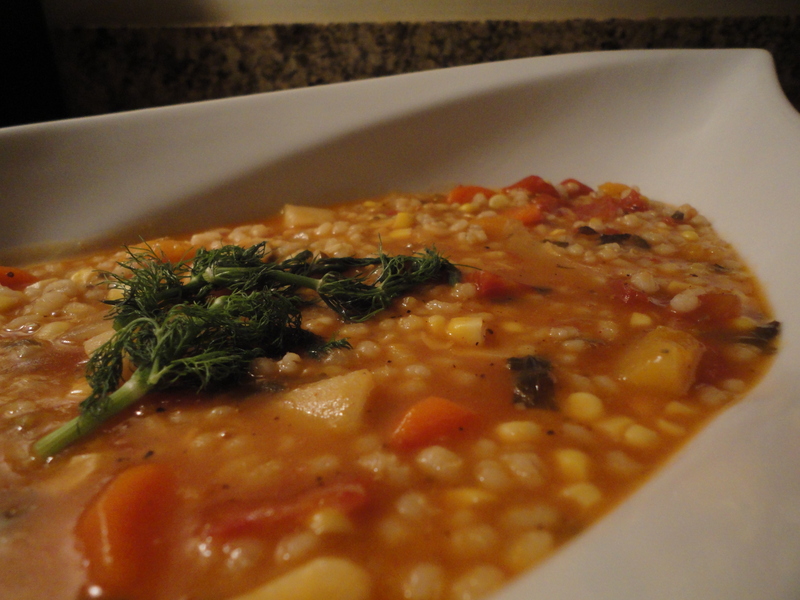 Of course I couldn’t simply make a regular old vegetable barley soup (where’s the fun in that? ), so I played with it a little and made a nice, hearty winter vegetable rendition of this classic comfort food. I hope you enjoy, and a big THANKS to those that shared their ideas on Facebook. Serves 4-6 as an entrée, or 8-12 as an appetizer. Heat the olive oil in a large pot (I use an 8qt sauce pot) on medium. Add the garlic, shallots, fennel, parsnip, carrot and celery, as well as 2tsp of salt, and cook for 10 minutes. Increase the heat to high and add the white wine, boil until reduced by half. Add the vegetable stock, water, corn cobs (NOT the kernels, yet) and bay leaves, bring to a boil then reduce the heat to medium low and simmer for 1 hour, stirring periodically. After 1 hour remove the corn cobs and bay leaves, then add the salt, pepper, paprika, diced tomato (with liquid), corn kernels, butternut squash, parsley and barley. Increase the heat to high and bring to a boil, then once again reduce your heat to medium low and simmer for an additional 45 minutes, stirring periodically. That’s it, you’re done! You are now the proud owner of a healthy, filling, and intensely flavorful vegetable barley soup. If you want to get fancy use a little fennel frond for garnish and added anise flavoring. Tags: barley, comfort food, homemade, perfect pairings, perfect pairings at home, soup, vegan, vegetables, vegetarian, winter. Bookmark the permalink. Ohmigosh! I didn’t even see this questionnaire on Facebook and it’s still vegan – how awesome! This sounds incredible. The addition of the fennel is something I wouldn’t have thought of but wow it must be so tasty. I have some veggie broth cooking today and I plan on making this soup with it later in the week. Awesome Jen, let me know how you like it. The fennel really gives it beautiful aromatics that fill the entire house.